Get more miles from your tires… and more miles per gallon! 1. You have to replace your tires more often. Over-inflation, under-inflation and, to a lesser degree, lack of rotation can all cause accelerated tire wear. So instead of getting full mileage out of a set of tires, you might get only half the expected tread life. These days, a good set of new tires, mounted and balanced, will cost you $400–1600 (depending on size and rating). If you don’t maintain proper tire pressure and (where possible) rotate the tires, you can easily double that cost because you have to replace them twice as often. 2. You spend more at the gas pump. Under-inflation also increases rolling resistance (friction), which can reduce your miles per gallon (MPG) by as much as 4%. If your car gets 20 MPG and you travel 15,000 miles in a year, that’s 30 gallons of fuel. Checking tire pressure & tread depth. Monitoring your tires is quick and easy. All you need is a reliable tire pressure gauge, a tire tread depth gauge and a notebook (or PDA). Having your own air compressor for inflating tires is handy but not essential. 1. Set up a tracking chart (below) in your notebook or PDA to record the following: date of reading; vehicle mileage; tire location (don’t forget the spare – see page 6); tire pressure and tire tread depth in three locations per tire: inner, middle, and outer. 2. Take pressure readings with the tires cold (i.e. in the morning before driving, or at some point after the vehicle has not been driven for a few hours; friction causes tires to heat up, expanding the air inside and increasing pressure). By using a cool tire as the “standard” you can be more accurate. If needed, increase or decrease pressure to the recommended psi. 3. Use a depth gauge to check tread depth between the outer, middle and inner tread blocks. Move 15-20″ around the tire and check again. Record the average for each area. Do this on all tires except the spare. 4. Check the tire pressures at weekly intervals (regardless of miles driven). If pressures are holding steady, you can lengthen the interval between readings. If pressure has gone down on any tire, add air as needed and check the pressure more frequently. Note: As ambient temperature changes (e.g. from winter to spring), you may need to add or remove some air in order to maintain your optimum pressures. 5. Check tread depth again after about 500 miles. Have any of the depths changed by a significant amount (1/32″ or more)? If there is no significant change, keep the pressure where it is and check tread depth again in another 500 miles. If you notice that the inner and outer tread blocks are wearing faster than the center, the tire is under-inflated and the pressure should be increased by 3 psi. If the center tread blocks are wearing faster than the inner and outer blocks, the tire is over-inflated and pressure should be reduced by 3 psi. (If you are finding grossly worn tire tread caused by over- or under-inflation as described above, you may need to increase or reduce pressure by more than 3 psi.) If you find the inner tread blocks are wearing much faster than the outer blocks, this is likely caused by excessive negative camber. (The wheel is tilting too far inward at the top.) We will discuss this in the Spring issue of Fast Times. Note: excessive wear of outer tread blocks from too much positive camber is highly unusual and would likely indicate an issue with your suspension. A. Precision tire pressure gauges. These gauges feature brass fittings, built-in bleed valves and rubberized armor for years of use. #H100X (with hose); #S60X (no hose). To help you achieve your ROI (return on inflation) sooner, we’re taking 10% off every one of these items. You can order by phone at 800.535.2002 or visit our online store at www.BavAuto.com/. Tire rotation is designed to compensate for differences in wear between front and rear wheels, and left versus right side of the car. BMW does not recommend tire rotation: we, however, highly recommend it. Our experience tells us this extends tire life and helps keep tread at a safer level on all of the tires. Rotations must be performed at regular intervals. Otherwise you can create wear patterns on the front or rear tires that could then be detrimental once those tires are moved to a new location. We recommend an interval as close to 5,000 miles as you can manage, but certainly no longer than 10,000 miles. (You cannot rotate tires too often.) A good rule of thumb is to rotate the tires when you change your oil. 1. Are the tires all the same size? Check the size on the tire’s sidewall (figure 1). If the tires are not all the same size (e.g.the rear tires are wider or taller than the front tires), you will not be able to do a rotation between the front and rear tires. 2. Do the tires have a directional tread pattern (designed to roll in one direction only)? Check the tire sidewall for notes on tire direction (figure 1). If the tires have a directional tread pattern, you cannot do a typical rotation that would move the wheels between the left and right sides of the vehicle, as this would make the tire roll in the opposite direction of the tread design. Note: If you have directional tires and are determined to rotate them, you can pay someone to dismount the tires from the wheels and remount them so that the inside on one side of the car becomes the outside on the other. We typically do not do this, but it can add significant life to your tires by evening out wear caused by excessive camber. Again, we will discuss ways to reduce tire wear caused by excessive camber in our Spring issue. 3. Is the design of the tire tread symmetrical or asymmetrical? Symmetrical tread looks the same on the left side as on the right side (inner and outer blocks; figure 2). 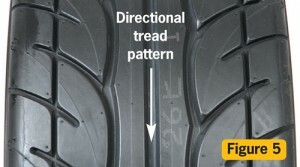 With asymmetrical tread, the inner and outer blocks are different because they’ve been optimized to perform under certain conditions (figure 3). Asymmetrical tires must be mounted with the proper side facing outward (figure 4), but they can be fully rotated, as long as they are not also directional (figure 5). We often see directional tires that are mounted incorrectly. 1. Full rotation. (This plan can only be used if all of the tires are the same size and are not directional.) In a full rotation plan, each tire ends up eventually being run at all four corners of the vehicle and in both rotational directions. This provides the most even tread wear for all tires. In this plan, you move the rear tires directly forward and cross sides as you pull the front tires to the rear. By the fourth rotation, every tire has been at every corner of the vehicle. 2. Front-to-rear rotation. If our tires are the same type and the same size, but have a directional tread pattern, we cannot move the tires to the opposite side of the vehicle. Therefore, we just move the front to rear and rear to front, keeping the tires on the same side of the vehicle. While not as effective as a full rotation, it does help to even out wear caused by drive versus non-drive wheels, weight distribution and differences in suspension components. 3. Side-to-side rotation. If the front and rear tires are different sizes, and they are not directional, we can rotate left side to right side and vice versa, keeping the fronts on the front and the rears on the rear. This helps compensate for uneven wear caused by negative camber and alignment issues.Remember: if the front and rear tires are different sizes and are directional, no rotation is possible. Make it easy on yourself with the right tools for the job. A. Jack stands. See the articles in the Winter 2008-2009 and Spring 2009 issues of Fast Times for more on the safe use of jack stands. B. Non-Marring 17mm lug bolt socket. Shown above: our 17mm, non-marring socket and Digital Torque Wrench (shown above). C. Bentley Repair Manual. The Bentley repair manual shows best jacking points for your model, and lists specific torque specs for wheel bolts/nuts. Also see THIS BLOG LINK for a chart of all BMW & Mini wheel torque values. D. Wurth Wire Brush. Use the Würth wire brush to clean dirt, rust and corrosion from wheel mounting hub and flange areas. Also great for cleaning brake calipers. E. Lubro-Moly Anti-Seize Compound. Use the Lubro Moly anti-seize compound to prevent the hub flange from corroding and seizing to the wheel hub flange hole. Coat the flange with a thin layer of the anti-seize compound. Optional: Floor jack. Faster, easier and safer to use than your BMW’s or MINI’s trunk jack. See Winter 2008-2009 issue of Fast Times. My husband fills his tires on his BMW Series 5 convertible every night when he comes home from work. He says winter months tires lose air – but c’mon, that much to require daily filling???????????????? We argue/discuss (I do not agree to disagree)this issue. I have never had a car do that to me in 45 years. Am I a crazy old lady???? In short, the tires should not be losing air at the rate that you are suggesting. Additionally, cold weather should have no affect on causing a tire to lose air. If you already have a leak (which is apparent, in this case), it could get a bit worse in the cold weather, but not necessarily. The tires (and wheels) can be checked for leakage by removing them from the vehicle and placing them is a tub of water. Leakage will be apparent as a stream of bubbles, or an occasional bubble, from the source of the leak.